This imaginative cardboard arcade is the awesome creation of nine year old Caine Monroy. After spending his summer vacation in his dad’s used auto parts store building a fun-filled series of elaborate games from cardboard, Caine opened up the arcade to the passers-by of his Los Angeles neighborhood. Like a regular games hall, Caine offered special deals – $1 for two turns, and $2 for a five-hundred turn ‘Fun Pass’. But even with deals like that business was slow, and Caine’s chances of getting a rush of customers were small. Until one day, independent filmmaker Nirvan Mullick stumbled on the arcade while looking for a car-part, and this chance meeting changed the success of the arcade, and the story, forever. Caine had spent months perfecting the design of the games, crafting prize displays, and even preparing paper-lunch-gift-bags. When Mullick spotted the arcade a flashmob was organized and they descended on the store. All these new customers turned the arcade into a new LA hot-spot, all while making Caine’s day in the process. Mullick then made this cool short film of the whole story which has since become an internet sensation, and the rest is history. A new scholarship fund was recently established in order to to send Caine to college. The fund asks for a small contribution of just $1, and now the Goldhirsh Foundation is matching all donations to help support more creative and inspired kids like Caine. 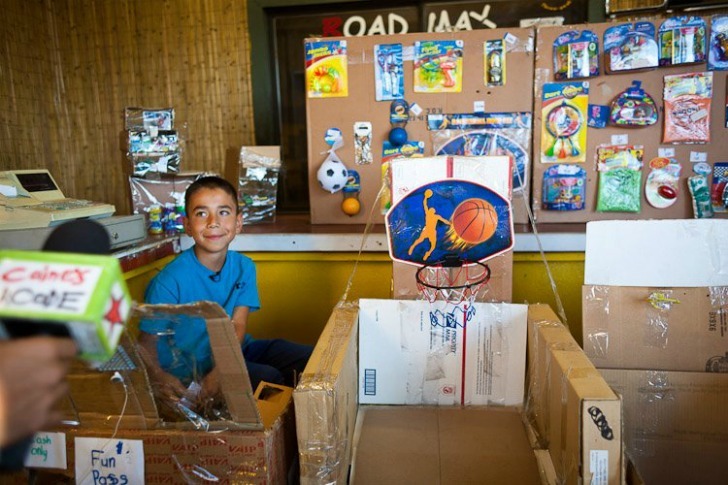 This imaginative cardboard arcade is the awesome invention of nine year old Caine Monroy. Spending his summer vacation creating a fun-filled series of elaborate games in his dad's used auto parts store in LA, Caine opened up the arcade to passers-by. Like a regular games hall he offered special deals - $1 for two turns; $2 for a five-hundred turn Fun Pass. 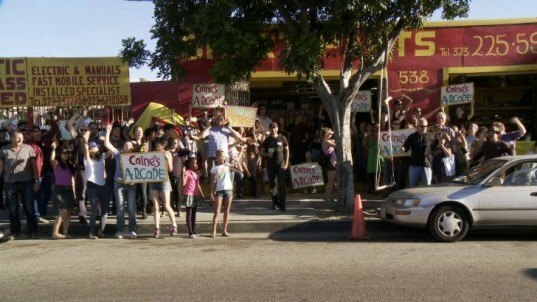 But even with a deal like that business was slow and Caine's chances of getting a rush of customers was small. Until, one day, independent filmmaker Nirvan Mullick stumbled on the arcade when he was looking for a car-part, in a chance meeting that would change the success of the arcade, and the story, forever. When Mullick spotted the arcade he and a flashmob organised a way of bringing lots more customers to the arcade and making Caine's day in the process. He then made this cool short film of the whole story which has since become an internet sensation. Caine had spent months perfecting the design of the games, crafting prize displays, and even preparing paper-lunch-gift-bags. The rest is history. A newly established scholarship fund to send Caine to college asks for small $1 contributions, and now the Goldhirsh Foundation is matching all donations to help more creative and inspired kids like Caine.